The high winds had blown through and there was a weather window for crossing to Eleuthera on Wednesday so it was time to get moving. I have very few pics of Marsh Harbour. As the Captain said it's a "big" town that is similar to being in Florida. It was Monday morning, so we were at Maxwell's grocery store (largest in Abaco) by 8:00 am and the bank by the time they opened at 9:30. We hit the marine store on the way back for more engine oil. We were back to the boat and anchor was up by 10:30 am. This was late for us, but as I looked around, 4 other boats were also pulling up anchor. 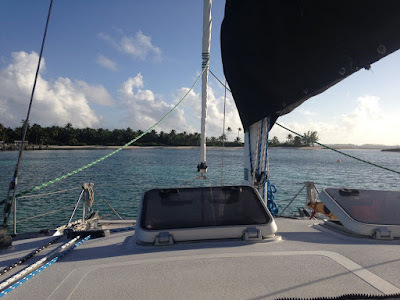 The catamaran behind us had his main sail up as he raised his anchor, so The Captain scrambled to unfurl our genoa as we entered the channel ("When is there a sailboat race? When another sailboat with sails up is in sight!"). 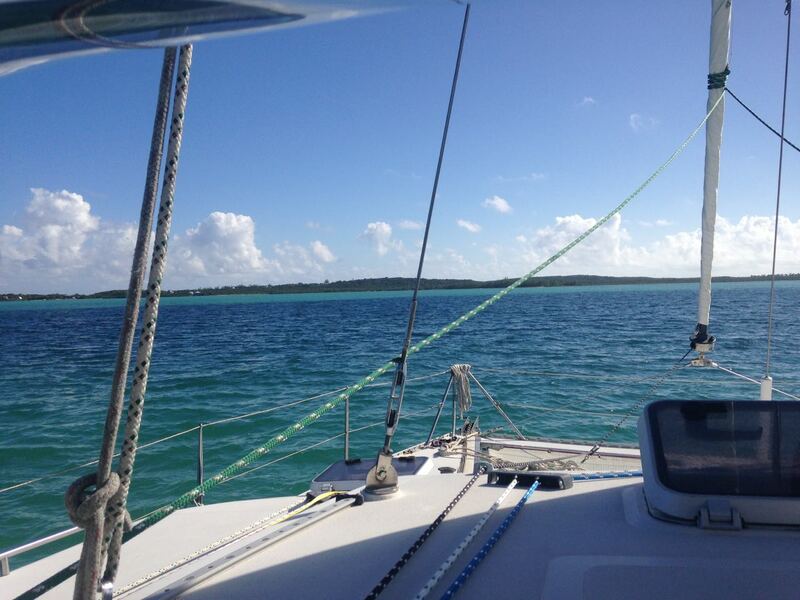 We motorsailed until we made a turn, then motored to the anchorage between Elbow Cay & Lubbers Quarters. It's called Tahiti Beach and pictures don't do it justice. There was only one other boat here. 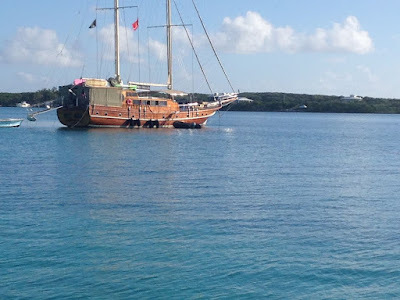 We both grabbed our snorkels and jumped in for a swim--(it's not near as clear, calm and pretty as Great Guana). We noticed the anchor missed the sandy patch we had aimed for and ended up in the grass, so we pulled up anchor and moved forward a little. Three more boats joined us before nightfall. For city folk, there is an all new kind of darkness at these out islands. The stars were fantastic and we could hear the waves crashing on the other side of the island as we fall asleep. Stats: total time 1:53, avg speed 5.2 kts, total mileage 9.8 nm, 1/2 motorsailed, 1/2 motored. We departed Tahiti Beach by 8:45 am and snuck by Kelly Nicole who anchored farther down. It was a zig zag route past a shifting sand bar and down to Little Harbour and we're able to cut a few more corners than they could which kept them behind us. We passed by the North Channel (a wider inlet that the mailboat uses) and the ride was rougher than we had expected. We can see Kelly Nicole's mast swaying back & forth. The Captain briefly let out his trolling line, hoping for some errant fish that came in the cut. No go. We passed Pelican Land & Sea Park. We're in 30 ft of water and can still see the bottom! It's supposed to be a great snorkeling area but the water looks too rough for me! 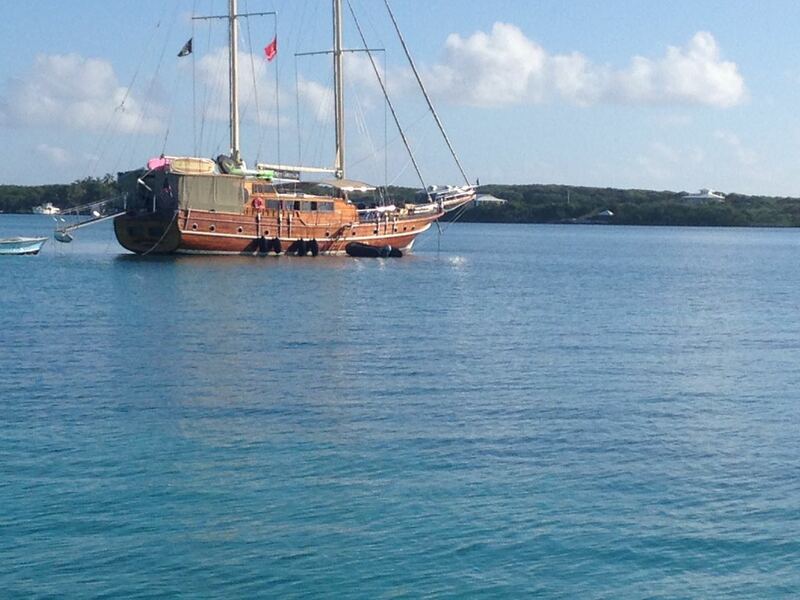 Kelly Nicole peels off at Lynard Cay and we continue on to the anchorage inside Little Harbour Bay. We slowly motored in until the swells from the inlet subsided, following the 7 ft contour line (we're at 2 ft high tide) out around we found a sandy patch. Kelly Nicole later tells us he calls this Bight of Rolly Rolly Puke Puke (thanks for the warning) but we didn't find it uncomfortable. This will give us a straight shot to the inlet tomorrow morning. I won't sleep great anyway. The Captain whips up a beef stew for dinner--good leftovers for after our trip tomorrow. We watch Bad Santa, "to get in the Christmas spirit" (replacing his old standby of Christmas Vacation. It was clarified that Jimmy Buffet christmas carols will be allowed on Christmas eve). 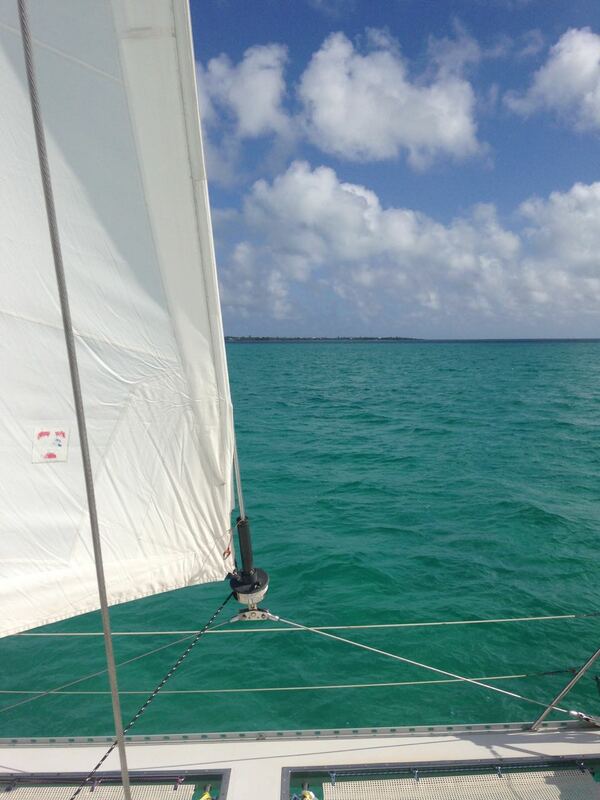 Stats: total time 2:32, avg speed 5.1 kts, total mileage 13.0 nm, 1/4 motorsailed, 3/4 motored. My hubby is one of those people who is always "racing" even when the other party doesn't know there is a race :-) We didn't make it to Tahiti Beach when we were in the Abacos - maybe next time.